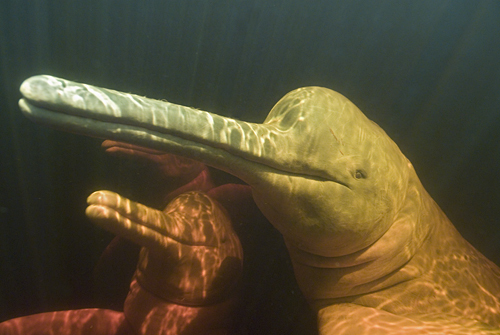 While they don't technically fit into the cryptid category - because there is proof of their existence and science can explain them - the Amazon pink dolphin, or boto as they're also known, are so rarely sighted that they may as well be creatures of mystery. But not to photographer Kevin Schafer, who says he is the first to photograph them in 2008, and who will be showing off his work in June's National Geographic. In an interview with AOLNews, Schafer calls the photos a "project of a lifetime." The male Amazon pink dolphin gets its bubblegum pink color because of scar tissue from fighting with other males, but interestingly the color has nothing to do with the shapeshifter legend of the dolphins. Within South American Amazon River folklore, the boto transforms into a handsome man at night to impregnate human women - or to sometimes lure men and women to underwater cities, wearing a hat to cover its blowhole while in human form - only to return to the river as a dolphin in the morning. Schafer apparently didn't photograph any transforming dolphins, but to read more about how these creatures affect the Amazon culture, visit eco-adventurer writer Bill Belleville's site to read an excerpt about the boto from his book, Sunken Cities, Sacred Cenotes and Golden Sharks: Travels of a Water-Bound Adventurer.